The Apple Computer company is founded by Steve Jobs and Steve Wozniak (April). In Idaho, the Teton Dam failed, causing 11 deaths and about $300 million in destruction (June). The band, U2 is formed, beginning a career that will span 40 years and include sales of over 150 million records worldwide (September). Get a taste of 1976 with one of the following New York Times Best Sellers from the week of February 22. 4. Saving the Queen by William F. Buckley, Jr.
Enterprise on its first flight, detaching itself from the Shuttle Carrier. Its first free flight took place six months later in October of 1977. In February of 1977, the Space Shuttle program took flight for the first time. The shuttles were designed for low Earth orbit, something the old Apollo program spacecraft were not capable of. 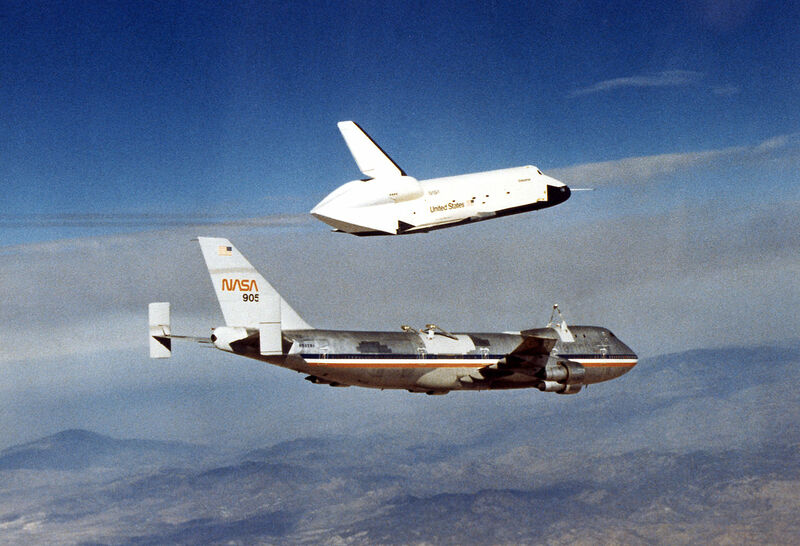 The Enterprise, the first shuttle to fly, had no orbital capacity, but served as a test vehicle for approach and landings. Five other vehicles – Atlantis, Challenger, Columbia, Discovery, and Endeavor – served as our link to space for over 30 years. There was tragedy as well as triumph; Challenger exploded shortly after takeoff in 1986 and Columbia disintegrated during re-entry in 2003. The Space Shuttle program finished its service in July of 2011 and NASA has moved on to other ideas, for manned as well as unmanned, space flight. Maybe a trip to Mars isn’t so far off in the future. A visual history of NASA’s many achievements in manned and unmanned space travel, written by a team of experienced NASA staffers and illustrated with more than 400 images, many of which are previously unpublished photographs from NASA archives. The story of America’s Space Age begins in the 1950s with intrepid test pilots venturing ever faster and higher, and opens out into the now-legendary Mercury and Apollo missions of the 1960s that made astronauts into national heroes. The Space Shuttle era shows us what everyday space travel might look like, while grand vistas of the universe expand our sense of wonder. Examines the history of NASA’s shuttle program, its missions, and its impending demise in a behind-the-scenes view of what was once the cornerstone of the U.S. space program. In 1978, the first group of space shuttle astronauts, 29 men and six women, were introduced to the world. USAF Colonel Mike Mullane was a member of this astronaut class, and this is his story. Mullane strips the heroic veneer from the astronaut corps and paints them as they are–human, with tales of military flyboys, feminist pioneers and post-doc scientists. He portrays every aspect of the astronaut experience, and is brutally honest in his criticism of a NASA leadership whose bungling would precipitate the Challenger disaster. Published in conjunction with the Smithsonian Institution’s National Air and Space Museum, a richly illustrated study of two decades of Space Shuttle flights utilizes full-color captioned NASA photographs to chronicle the accomplishments of the space program and provides a look at the more than 250 people who have ventured into space aboard the reusable spacecraft. A comprehensive history of space exploration chronicles the development of space technology, including rockets, vehicles, and equipment; the role of the “space race”; tragedies; key accomplishments; and past and future missions. In February 2003, American astronauts Donald Pettit and Kenneth Bowersox and Russian flight engineer Nikolai Budarin were on what was to be a routine fourteen-week mission maintaining the International Space Station. But then the shuttle Columbia exploded beneath them. With the launch program suspended indefinitely, these astronauts had suddenly lost their ride back to earth. An account of Space Shuttle history with astronaut biographies, interviews, and quotes; technical details; personal rivalries; and often stormy NASA politics. As American and Russian astronauts take their positions aboard the shuttle Atlantis, terrorists seize the Kennedy Space Center and threaten to blow up the shuttle if their demands are not met, and it is up to the mission’s injured former commander to stop them. A renegade terrorist with a personal and vindictive grudge against all things American targets the space shuttle as NASA prepares to launch an important mission with a high-profile payload and a wealthy visitor on board. Former astronaut Scott Blackstone finds his reputation and the future of space travel on the line in the wake of a terrible shuttle accident, but he faces a new challenge when a nuclear explosion in space threatens the lives of the construction crew on the International Space Station. Love is always in the air in February – at least all the retail stores are telling us that! With pink and red and purple hearts everywhere (not to mention chocolate), the Valentine’s season can become overwhelming. Taking a step back to smell the roses is probably also not advisable, since they’re filling the aisles, too. Instead, how about a musical interlude? The songs on this list are sweet – but not too saccharine – and they’ll remind you of why we like to celebrate this holiday. Plus, they’re pretty catchy, so you’ll have fun singing along! In July, ZIP codes make their first appearances on U.S. mail. Let’s time travel with the Way Back Machine the easy way – and pick up a book written that year. And since the New York newspapers were on strike during the early part of 1963, we’ll look at the Best Sellers list from the New York Times for the week of March 24. How many of these can you remember?